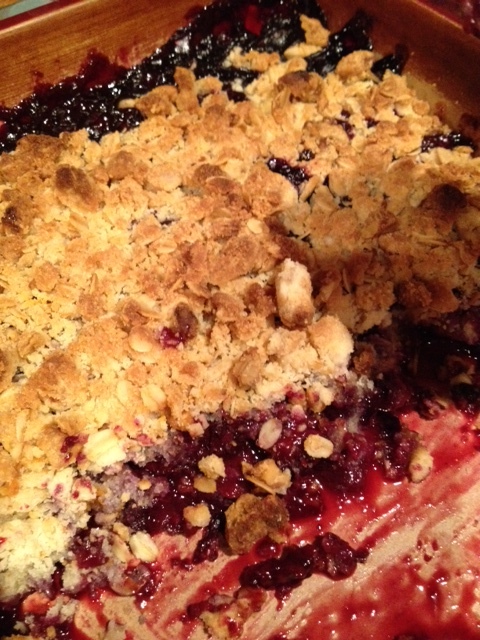 This is another favorite – Sue from the office loves this… I can’t for the life of me remember where I got the recipe. Fresh lemons give this pie a lovely tartness that balances nicely with the sweet whipped cream on top. It’s super easy to make. 1. Preheat oven to 325 degrees F. Beat egg yolks in medium bowl with rotary beater or fork; gradually beat in sweetened condensed milk and lemon juice. Pour into crust. 2. Bake 30 to 35 minutes or until set. Remove from oven. Cool 1 hour. Chill at least 3 hours. 3. Before serving, spread whipped topping or whipped cream over pie. Garnish with lemon zest (optional). Store leftovers covered in refrigerator. I got this recipe from a magazine, but tweaked it a bit. I added the blackberries and tweaked the crisp a little. It came out really good! Preheat over to 375. Make the filling by mixing berries, sugar, cornstarch, lemon (or orange) juice, and salt in a bowl. Pour into 8 inch baking dish. Cream butter and sugar in a mixer. In a medium bowl, mix together flour, oats, walnuts, baking powder, and salt. Stir flour mixture into butter mixture. Using hands, squeeze topping into clumps and sprinkle on top of fruit filling. Bake until bubbly and topping is brown (around 50-60 minutes). Cool before serving. Serve warm with whipped cream or ice cream. Mix all of the above in a glass until well blended. Drink in sips (it won’t taste that bad, but it won’t be yummy either) until done. It really works to help a sore throat and cough.